Laura Lezza/Getty ImagesAn electoral manifesto is displayed on the streets during the electoral vote on March 4, 2018 in Florence, Italy. Italy voted in a national election on Sunday, with polls closing at 11 p.m. local time. Early exit polls suggest no party will have enough votes to form a majority government, but the populist Five Star party looks set to win the most seats for a single party. Immigration tops the list of priorities for Italian voters, followed by unemployment and the economy. 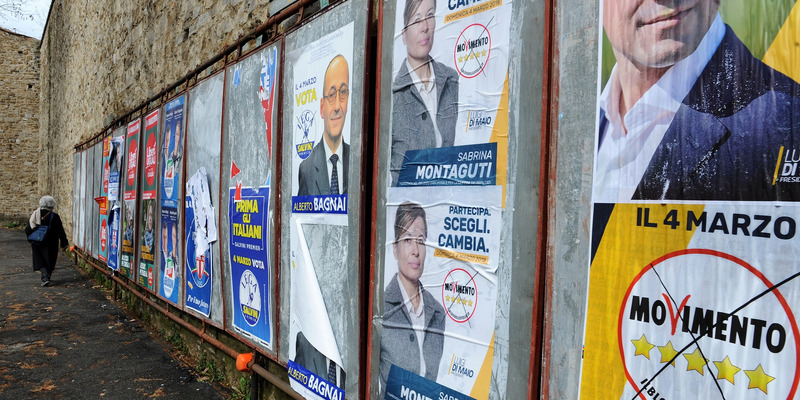 Exit polls suggest a hung parliament is a possibility after Italy went to the polls on Sunday. Polls for the national election closed at 11 p.m. local time, and full results will be released Monday morning. 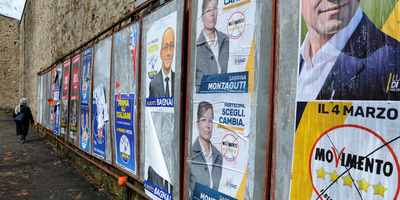 The elections have been a face-off between three major groups: Billionaire ex-Prime Minister Silvio Berlusconi’s center-right coalition, the ruling center-left Democratic Party, and the populist Five Star party, who were previously leading in the polls but have vowed not to enter into a coalition with any of their rivals, should they succeed. Latest figures from local media show Berlusconi’s Forza Italia party and his center-right coalition winning most parliamentary seats, with anti-establishment Five-Star party placing second, and the center-left bloc placing third. Five-Star is expected to be the biggest single party, but will likely not have a majority of seats once coalitions are accounted for. Several coalition prospects have been touted, including Forza Italia attempting a grand coalition with the Democratic Party in a continuation of the current government. Italian President Sergio Mattarella called for elections after dissolving the parliament in December. Analysts long said it was unclear who would emerge victorious, according to the BBC. The new Italian parliament does not sit until March 23. Following that, the President will give a mandate to party leaders in an attempt to form a coalition. In terms of voter priorities, immigration topped the list. Since 2013, more than 600,000 migrants have reached Italy and the influx has upset many voters, with politicians toughening their stance as a result. Berlusconi pledged to deport illegal immigrants should his center-right coalition win. Unemployment and issues relating to economic growth are also high on voters’ agenda, with Italy’s gross domestic product remaining 5.7% lower than before the global financial crisis. Stefania D’Alessandro/Getty Images for Giffoni Film FestivalCurrent Five Star Movement leader Luigi Di Maio. Italy’s election is shaping up to be a tight battle between three of Italy’s most popular parties. The anti-establishment Five Star Movement was founded in 2009 by popular comedian Beppe Grillo, and favours direct democracy over forming alliances with other parties. Current leader Luigi Di Maio has vocalized support for a universal basic income, and has already selected his cabinet dream team as a method of transparency. Berlusconi’s Forza Italia party has formed a bloc with the anti-immigrant League party and the far-right nationalist Brothers of Italy. Berlusconi’s party and his far-right alliance have used Italy’s growing unemployment rate and migrant influx to shape their policies, and in turn have seen a major spike in popularity. But Berlusconi cannot hold office until next year due to a tax fraud conviction. 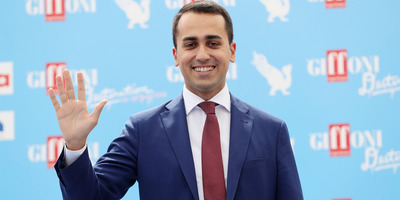 The ruling Democratic Party, led by former Prime Minister Matteo Renzi, has joined three smaller parties to form a center-left bloc focused on reviving the economy.